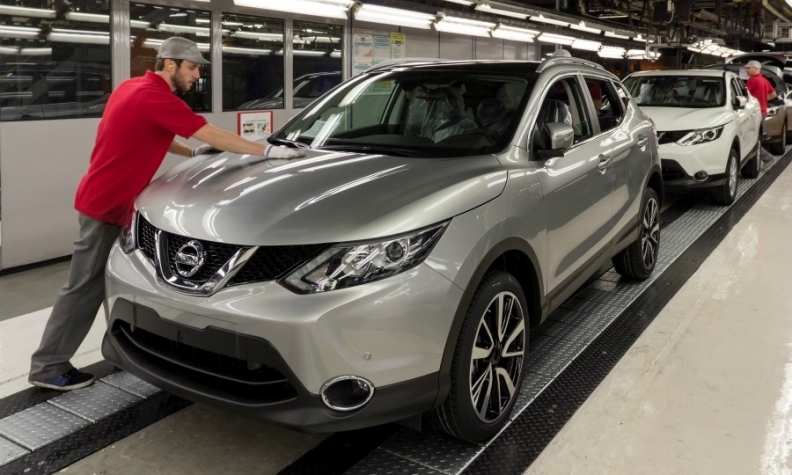 Nissan's plant in Sunderland, England, where a new-generation Qashqai SUV recently went into production, is helping to boost UK production. LONDON -- British car production returned to growth in March, boosted by increased demand in Europe. Output reached more than 142,000 units last month, an increase of 12 percent compared with March 2013, the Society of Motor Manufacturers and Traders said. In 2014 so far, production is nearly 3 percent higher than a year earlier, it said in a statement today. "After several years in the doldrums, European demand for new cars is now picking up with growth in the last seven months. This is a welcome boost for the UK’s volume manufacturers for whom Europe is the key market," said Mike Hawes, SMMT chief executive, in the statement. Hawes said the UK auto industry remains on course for all-time record levels of output by 2017 as new models are launched and investments are realized. Output fell earlier this year as carmakers such as Jaguar Land Rover, Nissan and BMW adjusted production lines to manufacture new models, an SMMT spokesman said. Britain's car market has been boosted by the turnaround in the country's economy and recovering demand in Europe, which accounts for about half of the country's automobile exports. European car sales rose 10 percent in March, the seventh consecutive monthly gain, as new models to replace aging vehicles and an economic rebound boosted demand. First-quarter sales in the EU and EFTA markets rose 8 percent to 3.35 million cars, according to industry association ACEA. Car production accounts for about 15 percent of Britain's overall manufacturing output in terms of value.